Subject: Instant attention means instant sales. In today’s web economy, trust and respect is everything. Giants like Facebook, Yahoo or Google knows this the same way you and I probably do. Now, what if I told you that today you are about to discover an out-of-the-box, incredibly smart technique to instantly grab your visitors’ by the throat and force them to pay attention to your message? Yes, by leveraging the trust and credibility from “the giants”! This is totally possible and in just a few moments you will get access to this cool way to get more attention – something that will allow you to spice up conversions and rock those bland sales that you are experiencing right now. Nowadays most online marketers are experiencing the following problem: they don’t get enough attention to their banners or ads. People are so used to this kind of commercial intention that they become “blind” to them. The results are lack of sales and money on the table. This is very simple…no attention, no money. Fortunately for you I’ve come up with a brilliant, powerful and effective tool to make people pay close and undivided attention to YOUR message (whatever it is) and make the “CLICK”. And do you want to know the best thing? You can achieve this in less than 3 minutes! Over the last months me and my wiz developer were working together to come up with a WordPress plugin that would “piggy-back” on the authority and trust of some of the Internet “big boys” like Google or Facebook for example. And after much hard work, sleepless nights and gallons of red bull I can safely say that I have created the “ultimate attention-grabbing plugin” that will make you MORE money! WP Notification Plus It's dead easy to use and it offers awesome customization features that you’ll simple love. 100% honest “Your-satisfaction-or-your-money-back guarantee” If you are not completely happy with the plugin, you will get your money back without questions, hassles or funny business. And if they come and immediately leave, you will be out of business in a heartbeat. 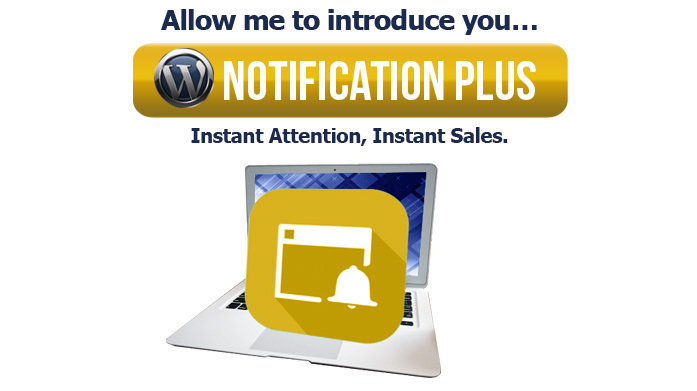 WP Notification Plus is the definitive tool that will make EVERY single visitor stay more onyour site, click on the notification box and increase your conversions. It simply works, and once you put it into action (it will take you only 3 minutes to install it and begin running it) you will see almost INSTANT results. With Tiger WP Notification Plus Lite version you will be able to use and test many premium features of the plugin.